Dry and bumpy skin on the arms can be caused by conditions like dry skin, Lupus and many others. Know your cause and get treatments accordingly. Dry bumpy skin is actually quite a common complaint. Many people are sensitive to things, or have just plain old dry skin. Whatever the case, it can be unsightly and uncomfortable to live with. Before you go changing your shower or laundry soap, you may want to take a look at the following things that can cause this to happen. What Does the Dry Bumpy Skin on Arms Indicate? Your skin may just be overly sensitive in nature and needs a little tender loving care with things you use on it. There are some other reasons that may be more serious than sensitive skin and need treatment. 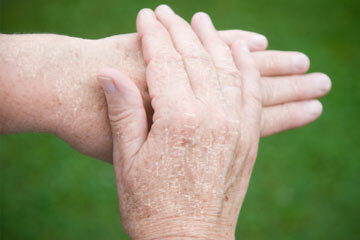 Eczema is an inflammatory skin reaction that is also known as dermatitis. Rashes can break out on the face, arms, and legs. It may be related to allergies, genetics, or inflammatory conditions in the body. There is a common link between food allergies, environmental allergies and asthma. Eczema tends to be common in babies and older adults. Removal of triggers such as stress, extreme temperatures, etc. Dry bumpy skin on arms can often just be the result of dry skin on your arms, and possibly all over your body. Dry skin is usually caused by external factors or the way you eat and drink. You may just have skin that needs frequent moisturizer applied or you may need more fluids in your diet. Whatever the cause, plain dry skin with no underlying conditions is easily remedied. 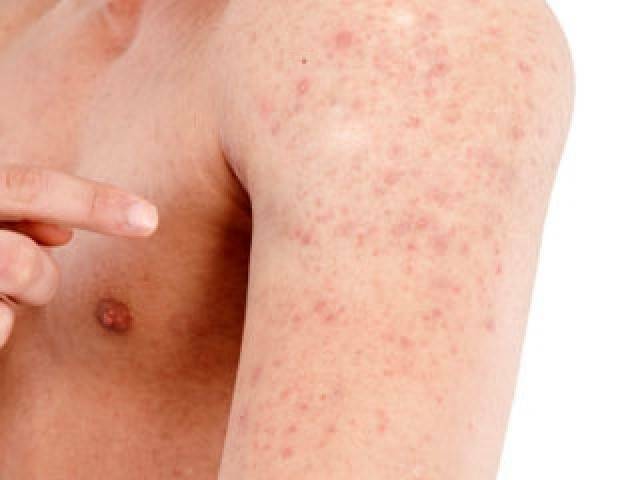 Acne can cause bumps and dry skin on the arms. This is due to excessive oil production, blocked pores, and even bacteria on the skin. Acne isn’t always associated with the arms because it most often occurs on the face, but it can actually occur anywhere on the body. The pores on the arms tend to be larger and produce more lubricants. You may notice bigger pimples and even a cyst. When your clothes rub on your arms the friction can shove dirt, bacteria, and oil into the pores causing them to clog. 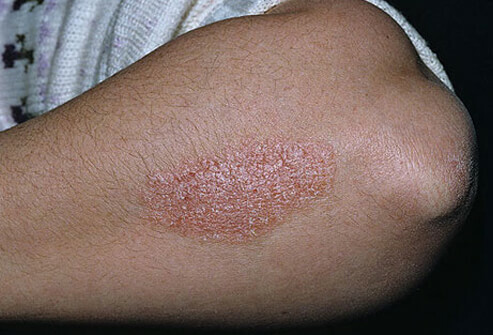 Psoriasis is a skin condition that causes the skin cells to grow faster than they should. Skin cells die off, but stay on the skin as new cells emerge. 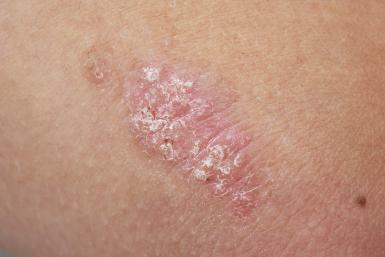 This causes a crusty appearance, scales, and a dry bumpy rash. It occurs on the arms, but can also affect the scalp, feet, elbows, and the knees. Treatments aim to smooth the skin by removing scales and also prevent the skin cells from growing too quickly. There are also many other treatments, just discuss with your doctor and find the treatments that work best for you. 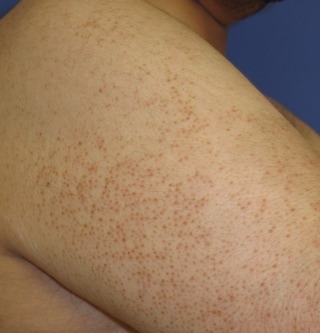 This is an autoimmune skin disorder that leaves a red inflamed bumpy rash on the skin. It starts out as a small patch of redness and spreads from the original site. It can occur on the arms, ears, face, and scalp areas. If you have hair on your arms, the patches may scar after a flare and cause hair loss. This condition may or may not affect the inner organs of the body. It is more common in females than males and is triggered by sunlight, stress, and exposure to chemical substances. Good skin care is advised. You need to use a good heavy lotion to moisturize the skin to prevent cracking. Doctors also suggest the use of a good sunscreen (SPF 50 or up) to prevent flares. Symptoms of Vicodin withdrawal include fatigue, restlessness, anxiety and irritability as the body learns to function without this substance. What Is Beta Hydroxy Acid and How to Use It?